I cannot tell you how many times I have read that you double your money in Australian property investment every ten years. It is the core assumption in all property marketing it seems. Of course to make any money out of that implied 7 per cent return per annum your rent has to cover your financing costs. The good news there is that with a tax break from negative gearing it just might. But the financing costs are not the whole equation. That 7% return also has to cover that expertly hidden finder’s fee, you know, the one that’s rolled into the price of your overpriced off the plan apartment without you realising. It also has to cover the real estate agent’s commissions, legal fees, stamp duty, the depreciation of any white goods and the cost of keeping everything just dandy. It also has to cover any renovations, managing agent fees, rates, the time you yourself spend mending the toilet, fixing the lights, replacing the roof tiles, unblocking the plumbing, replacing the boiler, let alone finding the property, selling the property, fighting tenants in court, dealing with body corporates and anything else that crops up, like stress and sleepless nights. And all this is before inflation and inflation is not 3% as the government claims. Anyone who has ever paid a utility bill, bought food, filled the car or paid a private school fee knows that we all have our own personal inflation rates and it has nothing to do with a government calculation designed to dumb down the real inflation rate. For decades even the government inflation rate has averaged over 4% anyway leaving you a 3% real return on property and that’s before you are taxed. Still think property is a ‘gimme’? 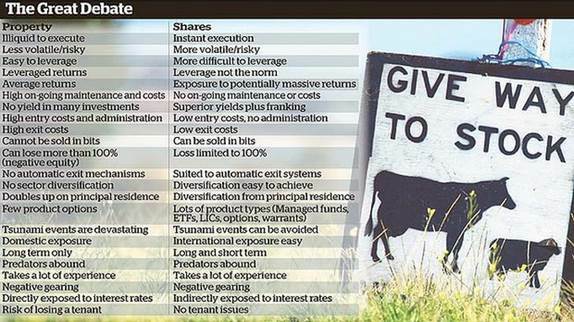 You can see why an equity investor finds the whole property thing a bit of a conundrum. When you buy BHP shares you don’t have to fix the loo, send them $45,000 to renovate or worry about that finders fee, the real estate commission, stamp duty and legals. You can buy it online for a competitive commission and after that you don’t have to find a tenant, worry about interest rates going up or do anything at all in fact, but decide when to sell it (easier said than done). Plus you can sell it in bits. Try selling your house one bedroom at a time to pay the school fees, or buy a car or go on a holiday. Plus you can do it in an instant, online, in the bath, on a whim, from your mobile phone from a bar and unlike the property market you can liquidate multi-million dollar portfolios in minutes. Try doing that after you’ve bought “Twelve properties in twelve months” as some of that marketing would have you believe is normal. In shares you can also get exposure to large gains and extraordinary gains. When did a unit in Bendigo last go up 20% in a year or thousands of per cent in a lifetime. In the last year 38% of the ASX 100 was up over 20% and plenty of stocks have been up thousands of per cent. So why is property so popular? The basic advantage of property over shares is that it is a more reliable, less volatile asset. Because of that the culture is different, the culture says you can safely borrow a lot of money to invest in it and in so doing make money out of other people’s, out of the bank’s, money as well as your own. The crux of property returns is not that you earn a paltry 7 per cent but, if the rent covers all the borrowing costs, you get the whole 7 per cent return as a return not on the value of the property but on the value of your deposit. In other words, on an 80 per cent lending ratio, if you buy a property for $100,000 and make $7,000 a year, you are actually making $7,000 on your $20,000 deposit, which is not a 7 per cent return but a 35 per cent return. That’s why you invest in property instead of shares, because of the gearing. Its powerful stuff. Of course you could do the same in shares, you could easily borrow 60 to 70 per cent on the big stocks, but you’d be mad to do so because whereas property is ‘safe and steady’, shares are volatile and risky, at least that's the perception. Ultimately they are different asset classes with the emphasis on different. It is not one or the other it is both or whichever one you are best at. If you are good at equities, which are hard, stick to equities. If you know the property market stick to property. I have both. You probably do too and there’s nothing wrong with either. For a list of the main difference between the two see the table.